One of the challenges undertaken by the Center is assessing learner variability in blended and fully online K-12 education. Center researchers strive to ensure that online learning—as it continues to grow at a rapid pace and reach consistently larger numbers of students—is accessible and effective for students with disabilities. This research includes evaluations of some of the most widely used online learning products in schools across the United States. K-12 online education holds promise in providing students with disabilities with personalized learning experiences and supports designed to enhance learning accessibility of the materials. But is online learning truly effective for students with disabilities? 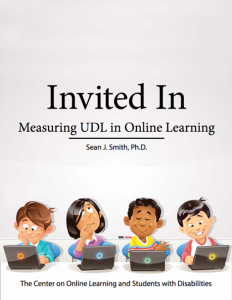 On January 28, 2016, the Center released Invited In: Measuring UDL Design in Online Learning. This report on K-12 blended and fully online lessons employs the Universal Design for Learning (UDL) framework to explore and evaluate the appropriateness of online content and instruction, especially for the struggling learner and those with disabilities. Invited In seeks to offer information to administrators, teachers, and parents to help them understand the online materials used by K-12 students and be able to determine how to foster optimal K-12 online learning options for struggling learners and students with disabilities. 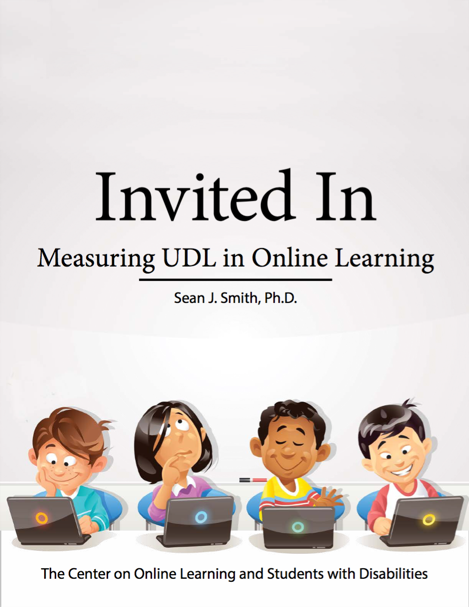 Download the full report, Invited In: Measuring UDL in Online Learning. Report sections are available individually below. This introductory section discusses the need to better understand K-12 digital content and its appropriateness for struggling learners and those with disabilities. Because the development and design of K-12 online materials can often be too cumbersome for districts and teachers to undertake, most products are developed and delivered by external vendors. While this development and delivery method may be time and cost efficient for schools, the pre-packaged lessons may not fully address the learning needs of all students. While the Volunteer Product Accessibility Template (VPAT) is a widely used measure to determine the accessibility of digital materials, the Universal Design for Learning framework can further expand understanding of accessibility issues for all learners. This section provides an overview of the VPAT and the UDL, as well as the UDL Scan Tool employed in this study. Six free and for profit K-12 online learning product providers, representing all K-12 grade levels and content areas, were selected for review. This section discusses the design of the study, how the vendors were selected, and how researchers scored each vendor using the UDL Scan Tool. Each vendor studied has certain elements in common with the other vendors (blended and fully online, across grade levels and content areas), yet each also has unique characteristics. Profiles of each vendor were created to provide an overview of the vendor and its products, with specific information on how each vendor scored in relation to the UDL principles and guidelines. This section provides an overview of Vendor 1 which offers free, fully online, primarily video-based products for learners of any age with extensive content in mathematics and science. Grades K-8 are the primary audience and the products are often used as a supplementary online resource for teachers and students, supporting face-to-face instruction. Reviewing more than 400 lessons across grade and content areas, findings suggest limited alignment to the core UDL principles and guidelines. Designed as a resource to supplement fully online lessons or to complete face-to-face instruction, this product address all grades and content areas. This product focuses on reading and mathematics and offers specific instructional resources that foster review and test preparation for standard-based curriculum across all grade areas (grades 3-8 content offers the most comprehensive resources). Vendor 2 showed the most alignment with UDL principle 1 (provide multiple means of representation), but did not score strongly in any principle area. One of the widely used K-12 online content providers, Vendor 3 features fully standards-based lessons for grades K-12 across the four primary content areas. Developed for credit recovery as well as fully online learning, this product is used in schools in all 50 states in public school districts, charter schools, and, in some locations, operating as a independent, fully online school for statewide access. Vendor 3’s scores are most strongly aligned with UDL principle 1 (provide multiple means of representation), with some alignment with principle 2 (provide multiple means of action and expression). Primarily a math and science supplemental program for grades 3-12, this product features a number of games, manipulatives, and simulations meant to extend face-to-face learning. Although the lessons align to curriculum standards, the digital materials are meant to support—not replace—classroom-based instruction. Vendor 4 scored some alignment with principle 1 (provide multiple means of representation), with principle 3 (provide multiple means of engagement) alignment being negligible. Vendor 5 offers a suite of products for grades K-8 in four primary content areas. For grades 9-12, products are geared toward blended and credit recovery needs. With concentrations in social studies, science, mathematics, and English language arts, the vendor also offers online curriculum for music, art, and world languages at the K-8 and high school levels. Vendor 5’s score were highest in principle 1 (provide multiple means of representation), but low in all principles. A comprehensive K-12 curriculum in blended and fully online formats, this developer seeks to offer a complete fully online program across grades and content areas. The pre-packaged lessons are meant to replace face-to-face instruction, aligning to state standards and including the necessary assessments to ensure competency. Initially targeting the K-8 classroom, this vendor now offers a 9-12 program for blended and fully online needs. As with the other vendors, Vendor 6 scored highest when rated against principle 1 (provide multiple means of representation). Scores in principles 2 (provide multiple means of action and expression) and 3 (provide multiple means of engagement) were poor. Each learning product developed has specific features, advantages, and disadvantages that influence personalized learning experiences. The structure of the lessons is critical to meeting user expectations and fulfilling their individual needs within the learning experience. Understanding both the learners’ needs and the products’ potential to provide accessibility and personalization options for all learners plays a critical role in selecting the best product for all learners. The Center wishes to thank the Office of Special Education Programs for its generous support, and the many researchers involved whose time, expertise and interest made this publication possible. This publication was developed under a grant from the U.S. Department of Education (#H327U110011). Its contents do not necessarily represent the policy of the U.S. Department of Education, nor should endorsement by the Federal Government be assumed.